Crafted to embrace spectacular views of the Pacific Ocean, the Ziering Residence is defined by its dramatically curved architecture and walls of glass. 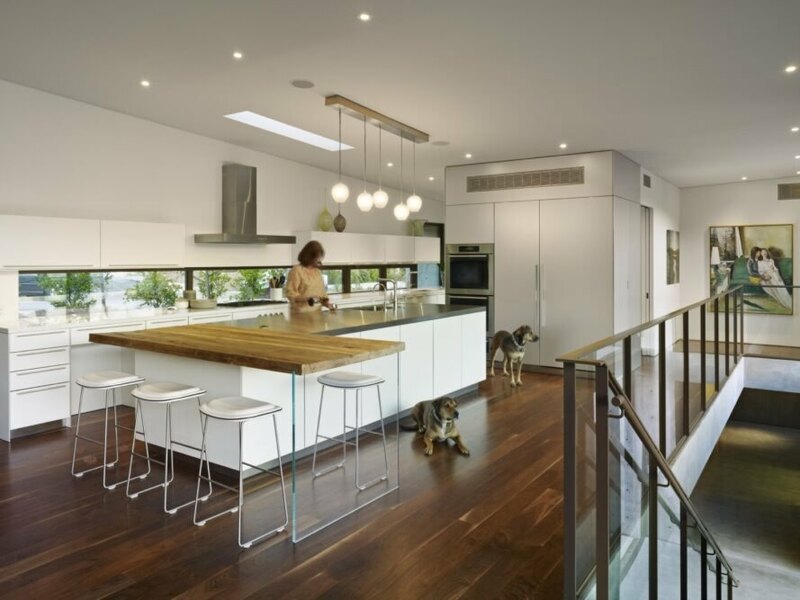 Local practice SPF: architects designed the contemporary house that’s perched high in the Pacific Palisades neighborhood of Los Angeles and engineered to take advantage of passive systems, including cooling ocean breezes and the thermal mass of concrete floors. The home also reduces its energy footprint with rooftop solar panels and solar hot water heaters. 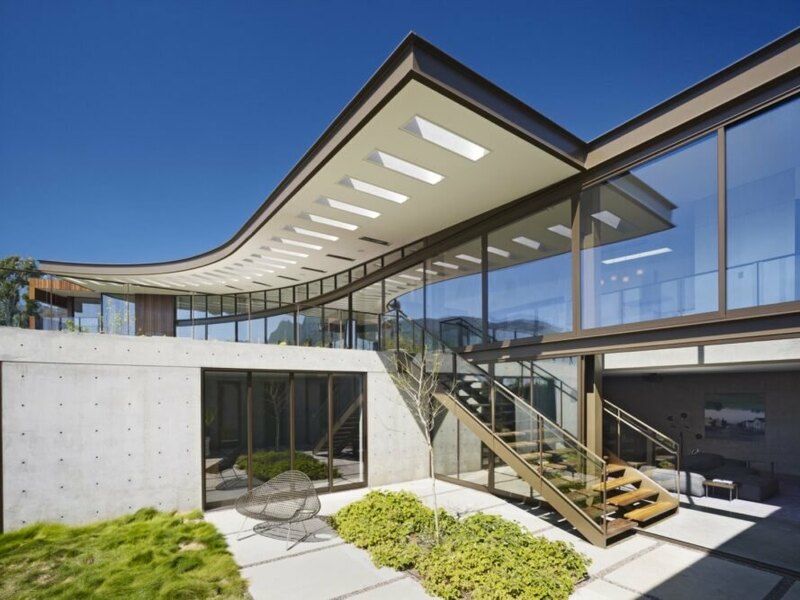 With Pacific Ocean views on one side and the backdrop of the Santa Monica Mountains on the other, the solar powered Ziering Residence was designed to embrace panoramic views on both sides while maintaining a deliberately low-slung profile so as not to obstruct views for neighboring residences. 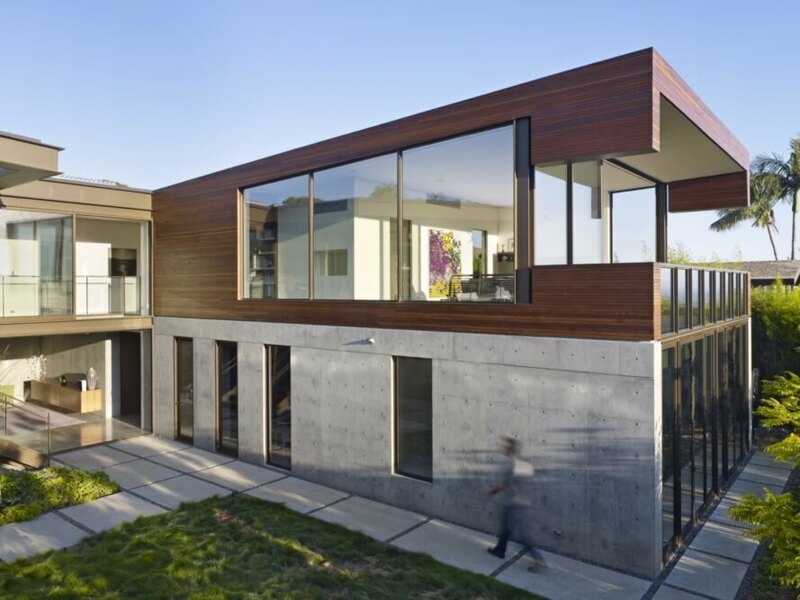 For privacy, the street-facing facade of the dwelling is clad in an ipe wood rainscreen. In contrast, the courtyard side is wrapped in sliding floor-to-ceiling glazing that seamlessly connects the interiors to the outdoors. The spacious 9,000-square-foot home is marked by an open-floor plan. The main living areas are housed in the curved section of the building, along with a guest suite, and overlook views of the ocean as well as the outdoor pool, courtyard and long wood deck. A large kitchen and parlor connects the curved wing with the bedroom wing that juts out towards the ocean and contains the master bedroom. The lower level, which is partly submerged underground, contains an office, two additional bedrooms, a study, technical rooms, a sauna and a gym. The home embraces spectacular views of the Pacific Ocean. 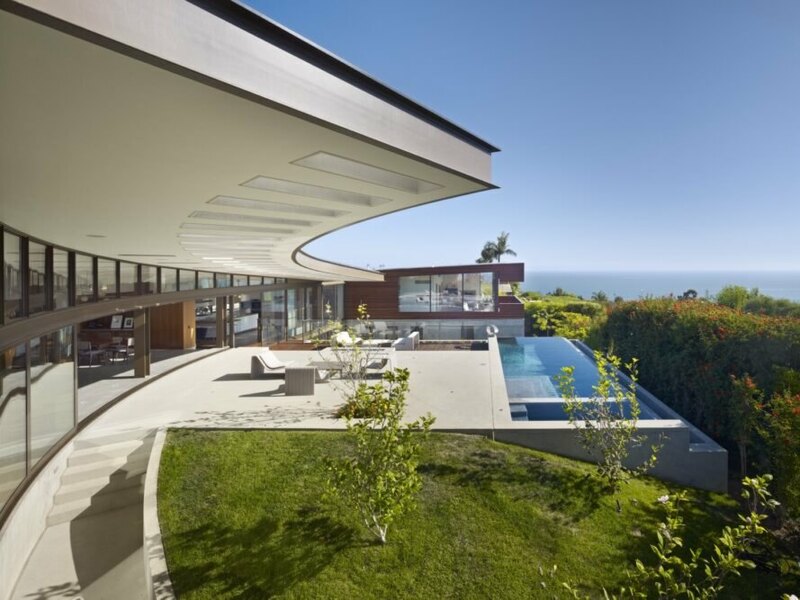 The Ziering Residence is defined by its dramatically curved architecture and walls of glass. 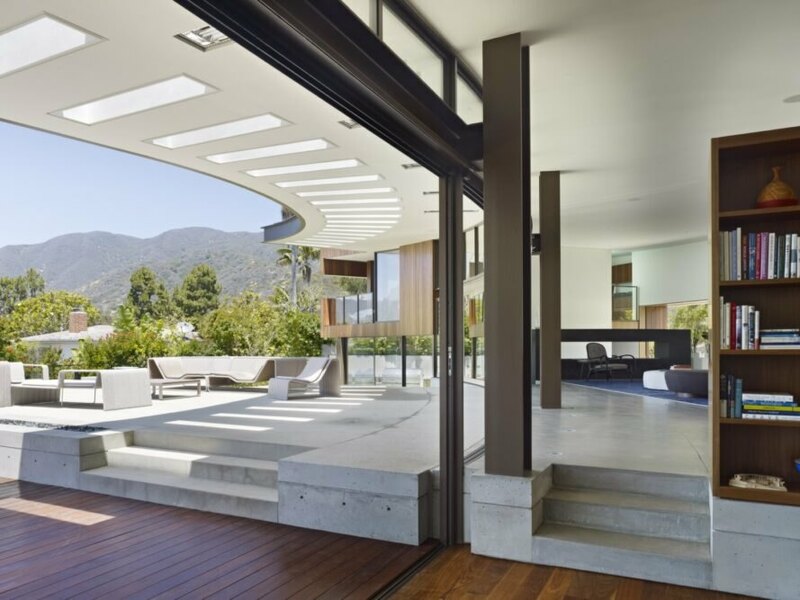 The contemporary house is perched high in the Pacific Palisades neighborhood of Los Angeles. The home is also equipped with rooftop solar panels and solar hot water heaters. 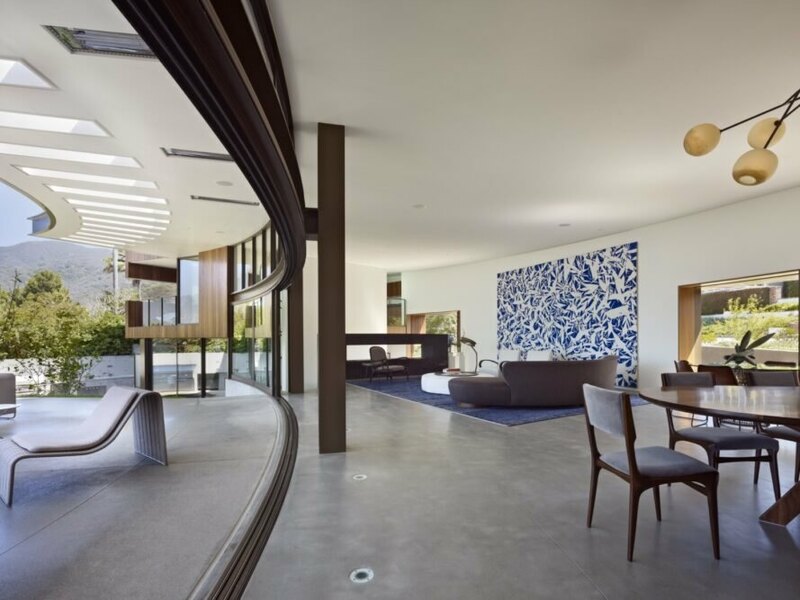 The house was engineered to take advantage cooling ocean breezes and the thermal mass of concrete floors. Architects designed the home to avoid obstructing views for neighbors. 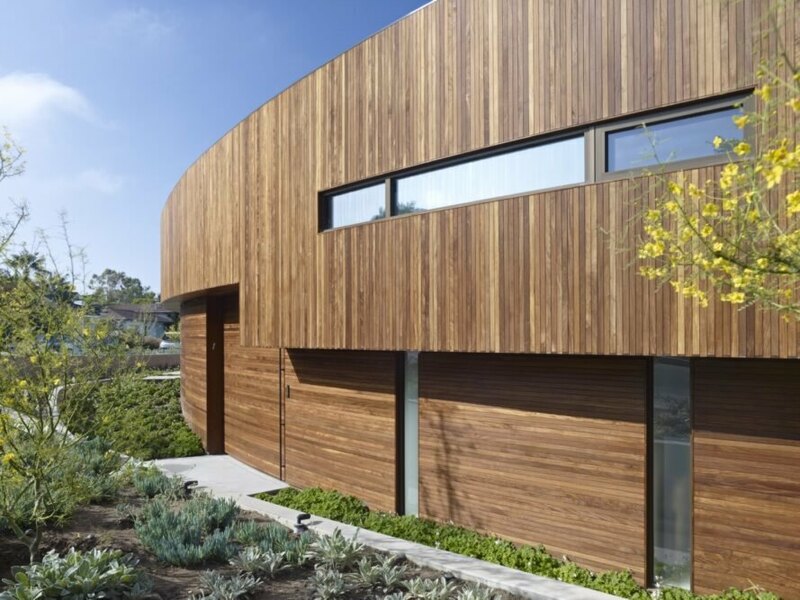 The street-facing facade of the dwelling is clad in an ipe wood rainscreen. The courtyard is wrapped in sliding floor-to-ceiling glazing. The home has mutliple features such as space for offices, bedrooms, sauna and gym.